Noorul Hasan, the prosecutor, continued to address the jury in the afternoon on April 3rd, Wednesday. Noor spoke with beauty, grace, and articulate intelligence. She performed well like an exquisite actress on the stage. The jury was transfixed watching her perform. She is very convincing and clearly knows her case well: this case of applicants’ attorney Jon Woods and his interrelated characters. Another applicants’ attorney defendant, John Jansen, charged exactly the same way as Jon Woods, has his trial ahead of him. Thus, he has a great interest in the outcome for Jon Woods. So, he sat watching the play unfold from an audience seat of the court room, casually dressed in blue jeans. Noorul spoke of how the Call Center of Carlos Arguello was in Tijuana. There in TJ was the sales force with the sales people. When a person who called in was on hold, the call center representative was calling an attorney. That rep would call attorneys until she-he got the ostensibly injured worker accepted. Veronica Soraida Castro was a capper in the call center. She expressed that of all the clients, she hardly ever met someone who had talked to an attorney before. Carlos Arguello owned Central Legal, the call center, and had many different names for the same business. He listed some of those other business names under his sister’s name, Tanya Arguello’s. He also listed a business name in the name of Dulce Gallegos. This was done to take the “heat off” according to witness Dulce Gallegos, because the investigators were dogging Carlos Arguello. Jon Woods started working with Fermin Iglesias, of Providence Scheduling. Fermin Iglesias is the one who introduced Jon Woods to Carlos Arguello. The contract with Arguello says… March 2011. C&E Technology. That was another name of a photocopy service. There were various names and lots of different phone numbers. The three way calls often connected to non-lawyer staff members. Carlos Arguello was cold calling, which is illegal for lawyers, and he had inappropriate ads. Shredding in Woods’ office was paid by USA Photocopy, owned by Edgar Gonzales. Gonzales provided storage, archiving of files, scanners, and photo copiers. He provided back office assistants. Edgar Gonzales paid the exact same amounts to a company called Latamer, based in Tijuana, ostensibly owned by Jon Woods long-term employee Emma Szuksztul. Noorul Hasan: What are the facts in dispute? Did he know? DID HE KNOW? Did he know? The prosecution asks. Did he know that Centro de Abogados (another Carlos Arguello business name) delivered clients and not “leads”? Noorul Hasan: Did he know? That referrals to Providence (Scheduling) doctors was part of the deal? That sending orders to C&E/PDM (Carlos & Edgar / Professional Document Management) was part of the deal? Edgar Gonzales paid for scanners and copiers. Then Noorul Hasan put up a big headline called Evidence of Guilt. She put forth her points of why Jon Woods is guilty. The defendant is a lawyer. 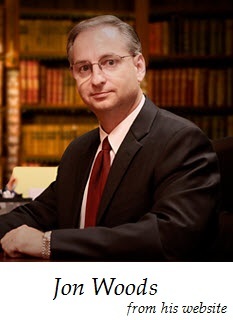 He specialized in workers’ compensation law since 2001. In March of 2011, he had been an applicants’ attorney for 10 years. He made his deal with Carlos Arguello starting in 2011. Carlos Arguello sold the clients he recruited to one of the lawyers. He’d tell them: here’s a list of doctors. Tell me when you’d like to get started. Noor Hasan: Because the contract was a sham. It was a front. Providence Scheduling was in on it. Providence Scheduling was part of the deal. USA Photocopy was paying all these expenses of Woods’ law firm. The sign-up service was the mechanism to get clients. It was the Call Center in Tijuana that dispatched the sign-up center to literally get clients. The sign-up service is part of Central Legal. Noor Hasan: I love emails… because they can’t lie. Jon is in the loop. Jon is always in the loop. Because, Ms. Hasan says, these are clients that are being sold. Joint advertising is just a front. Providence Scheduling was just a front. Noor Hasan: It’s all part of the same operation. Edgar Gonzales, the owner of USA Photocopy, paid the business expenses for Jon Woods’ law firm. Gonzales paid money to get subpoena orders for as many locations as possible. The prosecutor said Jon knew. He was in the know. Noor tells the jurors that the jury instructions are based on common sense: Logic and common sense. Noor Hasan: Is it reliable? Emails don’t lie. Is what they’re saying believable? The defendant took the stand and lied. Why are his practices such a deviation from the norm? Noor told how a warrant was executed at Professional Document Management, owned by Carlos Arguello, and at Arguello’s house. But Jon Woods testified that he didn’t hear about it. The prosecutor found this doubtful, unrealistic. She found it not credible that the defendant after so many years in the work comp claims community wouldn’t hear about it. Noorul Hasan: He’s been in the work comp community for so many years and he didn’t hear? These lies don’t make sense. It’s greed. A lawyer gets paid by settling a case and finally receiving 9% to 15% of the case value as a settlement. Noor Hasan: That’s why when someone like Carlos Arguello shows up, you sign on. Carlos Arguello’s scheme worked for the defendant. She told the jurors to look for what evidence corroborates.